Thousands of years ago, humans were always on the go: gathering berries, hunting prey, running from predators. Our metabolisms are still essentially the same as these humans and yet we are lucky if we can get in more than just the walk from our car to our desk and back again. With the rise of desk jobs comes the rise of ultra-sedentary lifestyles, even increased diabetes risk for women who sit too long. This is not your fault! Plus…You are busy! You work hard! You get home at the end of the day exhausted, and your only remaining energy gets allocated to helping your kids, then maybe watching a quick TV show before your own well-deserved bedtime. And while this movement is no longer built into our survival like our early ancestors, we still need activity for our body to thrive. 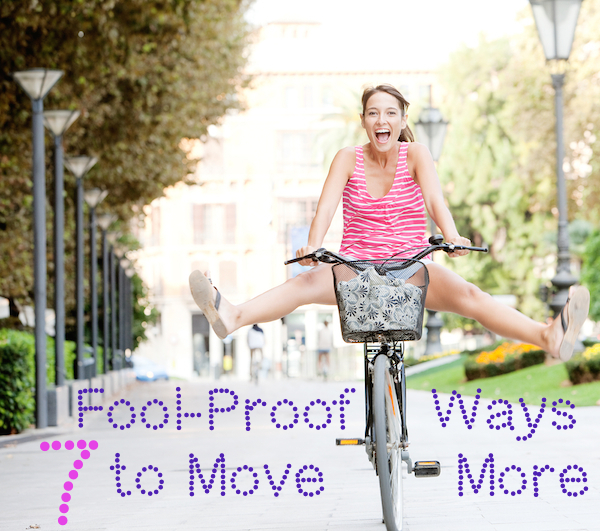 Here are 7 Fool-Proof Ways to Move More in Your Day. Not only does your body deserves this, it needs it. Is this groundbreaking new information? No. But it still hasn’t sunk in that we don’t need a 45-minute official workout class to add movement to our day. Even if you do hit the gym, we shouldn’t cash all our movement in at one time to justify sitting around the rest of the day. Start by just walking DOWN the stairs until you’ve built up the strength to walk up. This adds up to stronger legs, more endurance, cardiovascular health, calories burned. If we took all of the quick minutes of downtime in our day and used them to build strength or boost our heart rate even for only a moment, we’d be in great shape! Brushing your teeth? Lunges. Waiting for the shower to heat up? Squats. Microwaving popcorn? Jumping jacks. Waiting in line at the store? Single leg balance (just slightly lift foot off the floor for minimal social awkwardness). Long boring conference call? Walk around. This adds up to more flexibility, a natural inherent desire to move, and crushing your 10,000 steps goal every day. 3. Squat Down to Talk With Your Kids. I heard this from a friend and thought it was genius! If you bend down to talk with little ones throughout the day, it will not only improve communication with your little ones but you give you several spontaneous lower body workouts. Apply this to similar motions to reach down to your printer or a low filing cabinet, then go ahead and hold the squat to a count of ten while you’re there. This adds up to stronger legs and more toned glutes. Sometimes the simple act of knowing someone (or something!) is monitoring your movement is all the accountability you need. Pedometers or tech bracelets like Fitbit or Jawbone even buzz or blink if you haven’t met your movement goals for the day. Got sucked into your computer for too long? The tracker will know and help hold you accountable! This adds up to being more aware how little or much you move and where you need to make improvements. Mathematics alone will tell you that the longer you are awake, the longer time you have to be moving. Jump-start each day with a gentle walk around the block, cleaning your room, dancing to your favorite song, some light yoga-inspired stretches, or use that extra time to walk or bike to work instead of drive. This adds up to more focus and energy early on in the day, which lends itself to more meaningful movement throughout. No matter what you spend your days doing, everybody needs a break. Sometimes even 30 minutes for lunch can be a stretch. Set a timer on your phone so that every two hours you stop what you’re doing, stand up, and take at least five minutes to get fresh air, walk around, and clear your head before sitting back down. Perhaps even look into a more active workstation option. This adds up to being a more efficient, energized worker. 7. Start a Flexible Bedtime Routine. And we mean this literally. Do some stretching right before bedtime to boost your flexibility, lengthen your muscles, and help your body wind down for sleep. This is a great way to thank your body for moving so well throughout the day and prep for a restorative night’s sleep. As well, as you continue the habit, it will be a clear signal to your body that it’s time to shut down. Here are some more sneaky ways to squeeze in stretching to your day. This adds up to better quality sleep and flexible muscles ready to move any time you need them.